Get transported back to the time of Dickens, where street lamps used to get lit each night. 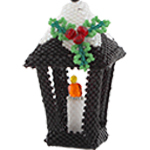 This Christmas lantern is very safe to hang on your tree with a beaded candle inside. This lantern takes around 8 hours to bead. As usual with ThreadABead featured patterns we give full detailed photographic instructions and in this pattern there are 91 detailed steps, making this pattern even suitable for beginners to beading. This ornament bead pattern is made using Japanese Miyuki size 11 Delica. A form of Round Peyote stitch is used but full detailed instructions are given and no previous knowledge of the stitch is required. Please note the pattern may not work with any other size and type of beads. There are 6 delica colours in total and the finished beadwork is approximately 5.5cm x 3.5cm (not including loop). 1 x 3mm Yellow, 1 x 4mm Jet Black, 3 x 4mm Siam, 4 x 4mm Crystal AB, 1 x 6mm Hyacinth, 1 x 6mm Jet Black Fire Polished beads are also required. The bead pattern supplied is 26 pages and includes 91 full colour photo instructions.